OMG....A Bug!!! Quick Kill it....KILL IT!!! I feel so pretty, and witty, and GAY! 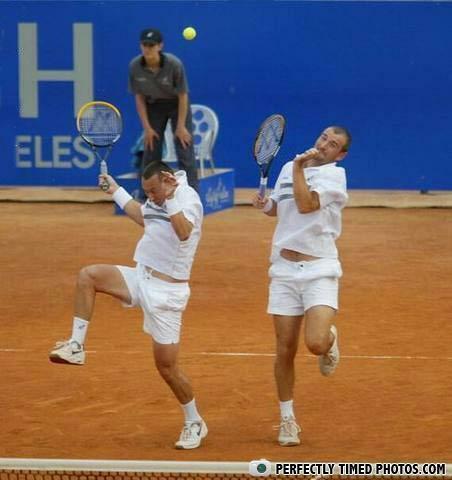 When Louis Spence discovered tennis. gotta pee gotta pee gotta pee!!!!! does that guy on the left have an erection? SIDEWAYS!?!?!?!?!?! Looks like one of those Gabber parties in the early 90s! Get it away, GET IT AWAY!!!!! Must be the French team. this is NOT a horse race. Quick! Just like we rehearsed! Tennis.. Your doing it RIGHT! In soviet russia, the ball hits YOU! I love to sing-a, about the moon-a and a june-a and the spring-a!